How do VANISH systems work? VANISH systems clarify wastewater using simple flocculation chemistry. Flocculation was first introduced in the United State in 1880. Flocculation continues to be fundamental part of municipal and industrial wastewater treatment plants the world over. Clean Marine Solutions has successfully tweaked the flocculation process to meet the needs of small industry. A study by the North Carolina Division of Water Quality found that average marine boat-wash wastewater contains 69,000 times the discharge standard for copper Clean Water Act. Almost all VANISH system operations are controlled by the systems’ PLC (programmable logic controller). The PLC controls the injection of treatment chemicals the duration of the treatment process and its LED screen displays information such as time to end of treatment. At the push of the AUTO button the VANISH system’s sump pump is activated. If water is detected in the sump, the raw wastewater is pumped into the treatment tank. The PLC and level sensors prevent the tanks from overflowing. When the Treatment System reaches capacity, a mixer activates to stir the wastewater. The VANISH uses three chemicals: a pH raiser and two treatment polymers. Each is easily prepared on-site using pre-measured concentrates. There is a chemical dosing pump for each chemical. Pumps are controlled by the PLC to precisely dispense chemicals in the proper sequence. While the wastewater is stirring, the pH probe monitors pH throughout the treatment process. If the pH is lower than required, dilute sodium hydroxide is precisely added to raise the pH to the optimum level for removal of metals. An Ultra-sonic Water Level Sensor senses the quantity of wastewater and the PLC calculates the precise amount of the two polymers to be added. Once the wastewater has been treated with the appropriate amount of chemicals and thoroughly mixed; the mixer will cutoff. The particulate immediately begins to settle to the bottom of the cone- bottom tank. A light comes on to signal that the solids have settled and can the clarified water can be transferred. The sludge is periodically drained from the bottom of the Treatment System’s cone-bottomed tank and dewatered by manually pouring through a filter. After dewatering, the sludge is set out to dry on a pad provided with the systems. What are the approximate supply (filters and chemicals) costs to treat a gallon of wastewater? If you send us a sample of your wastewater; we can provide a very close estimate. Supply costs vary from 1 to 3 cents per gallon depending on the quantity ordered. How many gallons of wastewater can be treated per day? Treat rates begin at 1,000 gallons per day and go higher. The VANISH 300 can treat about 1,000 gallons per day. The VANISH 555 can treat about 3,000 gallons per day. Custom systems are available if more treatment capacity is required. Can the treated wastewater be discharged to sewer? In some jurisdictions, a permit may be granted to dispose of the clarified wastewater into the municipal sewer. 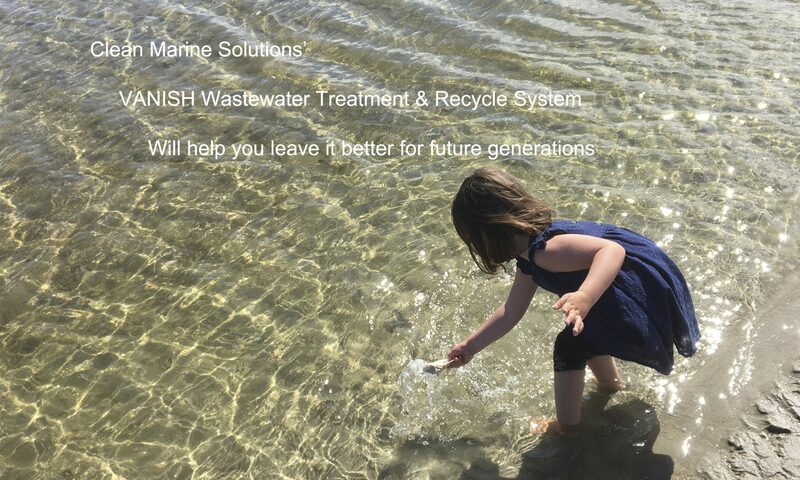 Clean Marine Solutions will be glad to review the wastewater quality standards in your area. The effluent (clarified wastewater leaving the treatment tank) from the VANISH systems will very likely meet the technical standards for discharge to sewer. Exceptions: An increasing number of municipalities do not allow any industrial wastewater to be deposed of through their sewer system. Municipalities that do allow discharge to sewer make insist on monthly water quality tests that make discharge to sewer too costly. In that case, recycling the clarified water may the better option. Note – A VANISH system was installed in Sausalito, California in 2014. The city quickly approved the clarified water for discharge to sewer. They said the high quality of the clarified water made approval easy. Take a close look at the VANISH system. You will see that many of the components (tanks, pumps, basic plumbing valves and motors) can be serviced by your staff. The electronic components are similar to marine electronic components – if a component goes bad, unplug it and plug in the new one. Our technical staff is available 24 / 7. We find face-to-face smart phones conversations very helpful. Is it difficult to prepare chemical solutions? No. Clean Marine Solutions provides chemicals in pre-measured quantities. We also provide graduated 5-gallon mixing bucket for each of the three chemicals. Let’s take the coagulant solution for example. The operator simply empties the Coag 791 container into the 5- gallon coag mixing bucket and adds tap water to the mark indicated on the bucket and stirs. Does CMS offer set-up and training? Training and setup are typically not needed – but it is an available option.